Aska Temple - "The Door Into Summer"
On The Door Into Summer, Japanese composer and multi-instrumentalist Jöhn Übel dips into his archives, and pulls out four fantastic pieces that vary in style and mood. In fact, of the five albums of his that I’ve heard, I would say this is the one to start with. It displays all the facets of music that fascinate him, from the electronic and avant garde German musicians of the 70’s, to classical piano music, to music that is deeply spiritual and engrossing. The title track, recorded in 1995, does indeed have a summery and also quite spacey vibe to it, as a beautiful, whirling synth sequence evolves into a breezy, upbeat workout that is simply as light as air. Here, I am reminded the most of one of Übel’s major influences, Ash Ra Tempel, especially in the style of his guitar-work, mellow and full of delay, almost sounding like an electronic sequence itself at times. Birds Singing Now Die, from 1996, is more reminiscent of an early Tangerine Dream piece, with heavy electronic sequences undercutting moody rushes of deep space synths. But Übel’s sighing, wailing, echoing, wonderfully freaky guitar work, sounding completely different from the previous piece, gives this one an entirely unique feel of its own. The Door, the shortest piece on the album, dates back to 1995, and is one of Übel’s minimalist piano pieces, utilizing repeating note sequences to create a placid, and lovely meditative setting. The album ends with the 22-minute space epic Shibuya EGG SITE Live, named, presumably, after the club it was recorded in (Egg Site is a popular music club in the Shibuya district of Tokyo). Recorded in 2001, Shibuya EGG SITE is a deliciously mysterious and creepy, rhythmless freakout, full of swirling, beeping, gurgling, rustling, rumbling electronics and nerve wracking, edgy playing on the guitar synthesizer. As you can imagine, not an easy listen, but it’s not impenetrably challenging either. Übel finds a precariously exhilarating balance between experimental and accessible. I can imagine the audience that night, absolutely awestruck by the sounds coming from the stage. 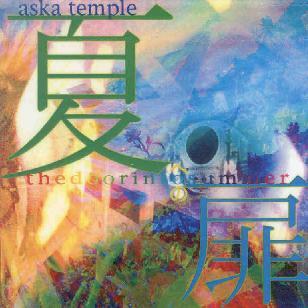 If you have a love or interest in the kinds of music mentioned, check out what Aska Temple is doing. This is a great place to start before delving into the many other CD’s John Übel has created.